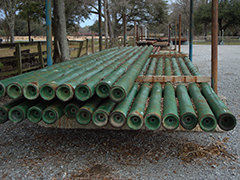 ALL Like New & Used Drill Pipe - Certified by Oilwell Varco (NOV) Tuboscope division. Go with a leader, SouthWest Pipe LLC, Louisiana. New Drill Collars ranging 3-1/8" to 7-5/8"
Benefits: Reduces wear for an extended service life. New Kelly ranging 3-1/2" to 5-1/4" & Used Kelly ranging 3" to 6"
The Kelly is used to connect the topmost joint of drill pipe for drill stem turning when the rotary table runs. R.J. Sandridge and Hugh Brashier experienced in buying and selling to pass the best price to you. New and Like New Drill Pipe, Drill Collars, and Kellys; REMAN Heavywater, Spiralwate, and Drill Collars; and Rebuilt Swivels, Rotary Tables and Mud Pumps; & New Rotary Tools. The lower part of the drill string, extending from the bit to the drill pipe. The assembly can consist of drill collars, subs such as stabilizers, reamers, shocks, hole-openers, and the bit sub and bit. 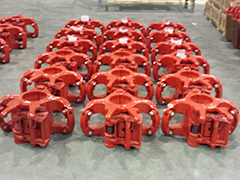 SouthWest Pipe LLC stocks New, Like New and Used Drill Collars. Drill pipe, is hollow, thin-walled, steel piping that is used on drilling rigs and horizontal drilling to facilitate the drilling of a wellbore and comes in a variety of sizes, strengths, and weights. Longer lengths exist. They are hollow to allow drilling fluid to be pumped through them, down the hole, and back up the annulus. 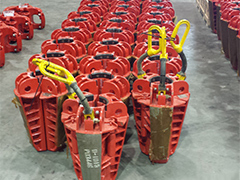 SouthWest Pipe LLC stocks handling tools for the drilling operation. The tools are used for suspending, moving and rotating tubulars in and around the well center and on the drill floor. You will find a complete stock on new Drill Collar Slips, Rotary Slips, Safety Clamps, Manual Tongs and Slip Type Elevators. 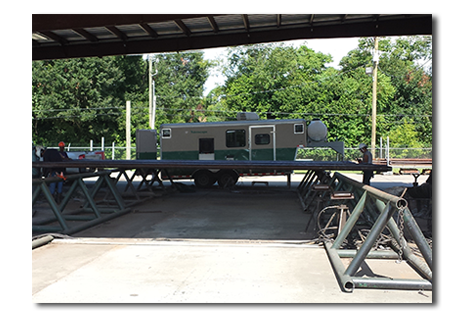 SouthWest Pipe LLC of Broussard, LA sells new Drill Pipe Elevators for use in a drill string. We are the leading supplier of new and used drill pipe, drilling equipment, and tubular products. All "Used" Drill Pipe, Drill Collars, Kellys and Heavywate and REMAN Drill Collars and Heavywate are inspected by National Oilwell Varco (NOV) Tuboscope division. NOV® Tuboscope’s® industry leading technology and proven experience in inspection, machining services, inventory management and corrosion control products increase tubular life cycle and maximize your investment. Tuboscope has been performing inspections on tubular goods for more than 70 years. From a single machine shop in 1938 to more than 190 locations in 49 countries on six continents, Tuboscope continues to provide value added services which reduce risk and protect customers’ investment. Tuboscope inspection services have grown with the market - providing superior support worldwide. We use the highest quality NDT methods which include ultrasonic, electromagnetic inspection, eddy current, magnetic particle, penetrant and visual inspection of tubular goods before they are placed into service. Why go anywhere else? Contact RJ Sandridge for complete information. RJ Sandridge is the co-owner and operator of SouthWest Pipe, LLC located just south of Lafayette, LA. He has over 25 years of procurement experience in the oil & gas industry. 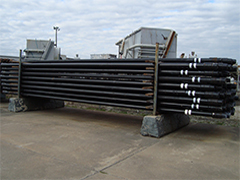 SouthWest Pipe LLC sells and purchases equipment for the oilfield industry. Find out more..